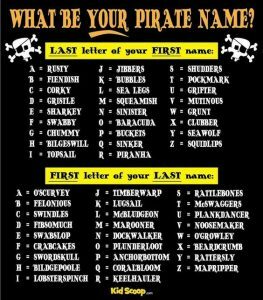 Icebreaker – As children enter, have them think up their own pirate names and create a nametag. Or, use one of these charts that give you names based on your initials: www.pinterest.com/pin/386887424215124174/?lp=true . Offer some plastic eyepatches and temporary tattoos, to help people get into character. Refreshments – Root beer, fish crackers, gummy worms. Treasure Hunt: Rework a library scavenger hunt into a pirate treasure hunt, with clues sending players to pirate fiction titles, or the nonfiction area on pirates. Include pirate media titles, too! Ring the Parrot: Obtain some stuffed animal parrots. Line them up on a table and give player three large embroidery hoops. See if the player can ring the parrot! Walk the Plank: Have two players line up side by side. Have them walk along a wide piece of masking tape that is taped to the floor or patio outside – see who can walk heel-to-toe the fastest (no running)! 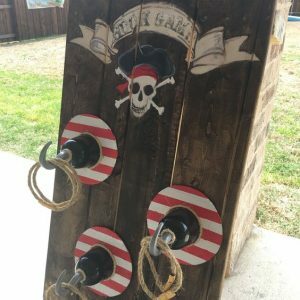 Captain Hook Ring Toss: Purchase some Captain Hook hooks at the costume shop; attach them to a board. Give players three rings and see if they can toss the rings onto the hooks: www.pinterest.com/search/pins/?q=pirate%20ring%20toss . Pirate Bowling: Print out these pirates (www.dltk-kids.com/t.asp?b=m&t=http://www.dltk-kids.com/crafts/pirates/color/cposter-pirate.gif) and cut them out. Glue to empty water or soda bottles. Add about one inch of water to each bottle and recap. Line up the bottles like bowling pins and give player three tennis balls to roll at the pins. Award prizes based on how many pins are knocked down. Treasure Maps: You can color paper towels with tea, or use the brown towels often used at school, to make simple treasure maps: www.dltk-kids.com/crafts/pirates/mmap.html . Pirate Flags: Here is a free template: www.teachingideas.co.uk/pirates/design-a-flag. The only other supplies needed are crayons or markers. Buccaneer Hats or Bandanas: Make these simple bandanas as shown here: https://family.disney.com/craft/jack-sparrows-bandana/ . You can also make newspaper hats and decorate them to look like pirate hats. Spyglass: These spyglass/telescopes are made from paper towel tubes: www.dltk-kids.com/crafts/columbus/mspyglass.htm . Parrot Bookmarks: Print out the parrot template seen here: https://ideas4kids.org/media/pdf/2009/07/09/parrotbookmark.pdf . Let kids color and cut out the pieces; have teen volunteers help them assemble the parrot. Attach the parrot to a cardstock bookmark. Pirate Puppet: Make a pirate stick puppet using this template, brass fasteners, and a craft stick: www.education.com/worksheet/article/pirate-paper-puppet/ . Also, check out our suggestions for a “Pirate”-themed storytime: www.bayviews.org/storytime/stpirates/ .